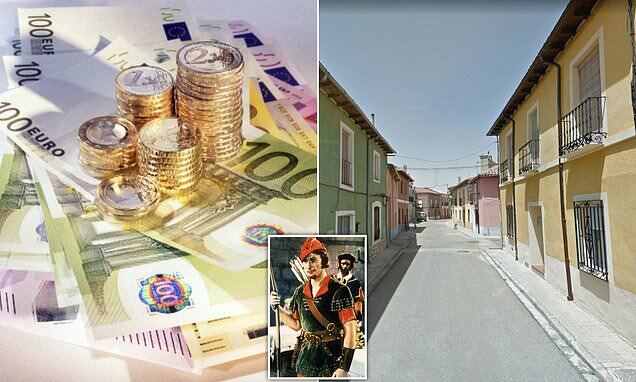 Residents of a tiny Spanish village have been left mystified by an anonymous donor who leaves envelopes of cash in postboxes or under people's doors. Since Wednesday last week, about 15 people in Villarramiel, northern Spain, have received envelopes containing up to 100 euros in notes, Mayor Nuria Simon told AFP. Locals are trying to work out why a group of apparently unconnected people in a village of just over 800 residents have been singled out for the gifts. Some Spanish news reports have labelled him the 'Robin Hood of Villarramiel'. 'We're all bewildered and expectant as we don't know where this money comes from or who the benefactor is,' Simon said.